Q-Snaps. 20 Extension Kit  - $12.16 : Yarn Tree, Your wholesale source for cross stitch supplies. Item 2023. 20" Extension Kit. 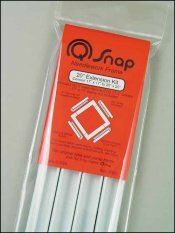 Extend the size of your Q-Snap frame with this extension kit. Makes a 17” frame into a 20”x20” frame. Kit includes four 3” extenders and four clamps for a 20” frame. Simply slides on to the end of your existing 17” Q-Snap frame. [original item SF20EK].